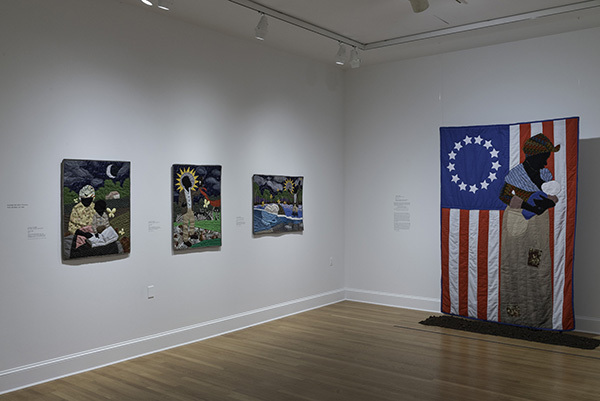 At center of this exhibition, the monumental installation Birth of a Nation (2014) represents a black woman nursing a white infant against the backdrop of the first official flag of the United States. Suspended above a mound of earth, the quilt is surrounded by Towns’s Story Quilts (2016–2018), a cycle of seven works in luminous fabrics and glass beads that narrate the life of Nat Turner and the 1831 rebellion he led against slavery. A pair of quilted oval portraits of Nat and Cherry Turner (2018) adds a significant dimension to this narrative, considering the role of a marriage in historic events. Towns’s quilting practice delves into the perspectives of women and people of color and draws on that knowledge to interrogate the institution of slavery in American history. Trained as a painter with a BFA in studio art from the University of South Carolina, Towns (American, b. 1980) has also developed a rigorous, self-taught quilting practice. Towns draws visual inspiration from medieval altarpieces, nineteenth-century photography, and Dutch wax print fabrics, in addition to African American story quilts. His work has been exhibited at Arlington Arts Center, Galerie Myrtis, Gallery CA, and Goucher College’s Rosenberg Gallery, among other venues. Towns won the inaugural travel prize of the Municipal Art Society of Baltimore City in 2016, traveling to Ghana and Senegal to visit historical sites that mark the Transatlantic Slave Trade. He was the recipient of a Ruby Artist Project Grant in 2015. This exhibition is generously sponsored by the Estate of Margaret Hammond Cooke and the Jean and Allan Berman Textile Endowment Fund. This is the first museum presentation dedicated to the stunning textile work of Baltimore-based artist Stephen Towns. See Stephen Towns in conversation with Mark Bradford. Installation view, Stephen Towns: Rumination and a Reckoning. Photography by Mitro Hood.